I have concluded my favourite films of 2013 but I thought those that didn’t make the list did deserve at least some recognition and credit as there were many releases that took me by surprise and entertained emphatically. The World’s End was absolutely great and was a popular release and favourite for many but it took me by surprise as I expected a huge let down compared to the likes of Shaun of the Dead and Hot Fuzz that are now hilarious classics but Pegg and Wright teamed up again to round off a great trilogy with no let downs. Dark Skies wasn’t perfect but it does deserve credit as a good horror in a year when the genre didn’t really glorify itself. With a good storyline and execution I really enjoyed it much to my surprise. Despicable Me 2 was a huge box office success and a huge family favourite of 2013. After seeing and enjoying Despicable Me I was expecting this sequel to be more of the same but instead the refreshing twist and hilarious minions made it more enjoyable than first imagined. 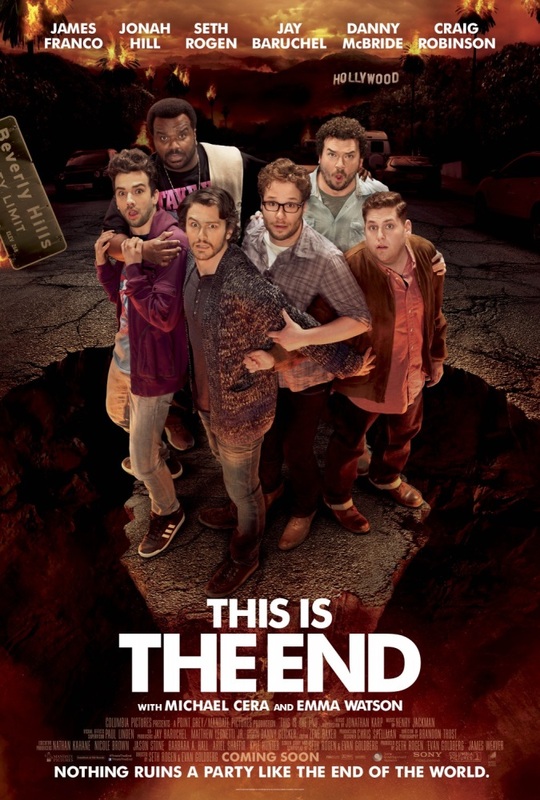 This is The End was one of my favourite comedies of the year in a genre that really flourished. When I saw trailers I assumed it would be much like the other previous releases where we watch Rogan smoke a few joints and crack a joke or two, being funny but average, however with the huge ensemble of great a cast it was just brilliant! The Heat was my favourite comedy of the year making me laugh non-stop! What surprised me most is the diversity Bullock showed from providing great comedy to a great classic in Gravity. The Heat didn’t look all good at first with some dodgy airbrushing but it proved me wrong! Fell free to comment below and tell me your top surprises of 2013! The year of 2013 has been a great year for the film industry and cinema; there have been some outstanding releases that have therefore played a role in advertising cinema in all its glory; however there have also been those flops and shameful failures. I have been lucky enough to have viewed many new releases this year and more so, some outstanding ones. I have also been lucky in dodging some of the terrible showings. I will not be awarding films generic titles but ones that suit its viewing most accordingly. I SHOULD HAVE KEPT MY £10 AND BROUGHT NETFLIX AWARD! Surprisingly there was no contest for this award even with Movie 43 and The Harry Hill Movie being released in the same year. Oblivion for me was the worse film of 2013 that I had paid to see and even with that in mind, I’m sure it still would have been equally terrible if it was free! 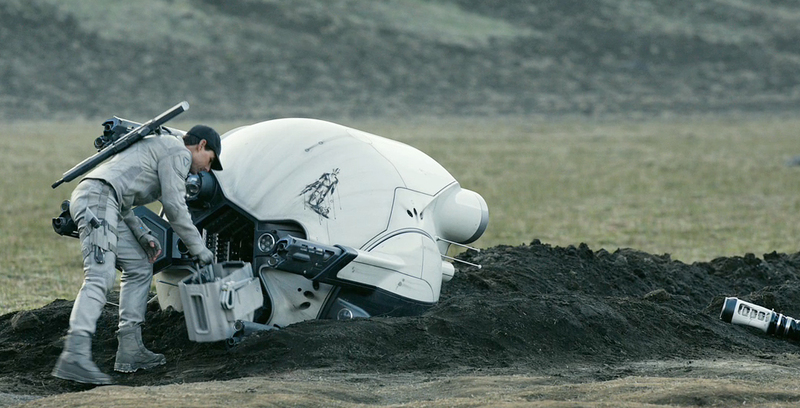 The story to Oblivion really didn’t reveal itself till the end so for the most part it was Tom Cruise fixing broken droids with chewing gum and fighting his own clones in a “Tom Cruise-off”. It was just a really poor film that seemed the only purpose it fulfilled was to remind us all how egotistical Mr. Cruise is. For the majority of this film apart from planning the fire exit route home, I was actually thinking of things I could have brought instead, and yes a month’s trail of Netflix crossed my mind! IT WAS WORTH THAT EXTRA £1 FOR THE GLASSES AWARD! Most films I’ve seen in 3D have really not been worth that extra £1 for the glasses nor the hassle of the glasses irritating your head. However on that very short list is a 2013 release that I believe is the best cinematic viewing experience in recent years! Gravity was outstanding and its use of 3D was just brilliant. The scene that was most amazing consisted of Ryan Stone’s (Sandra Bullock) tears falling from her eyes towards your face out of the screen. Alfonso Cuarón editing and effects should be applauded. 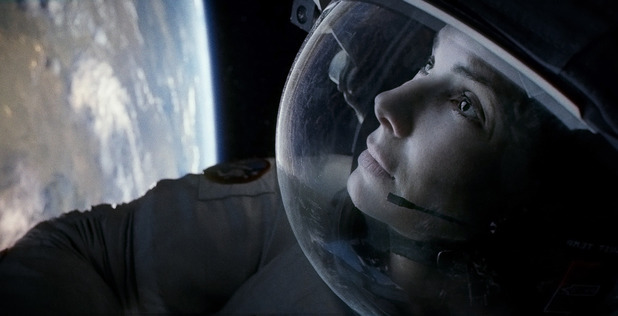 There were really no other contenders for this award, Gravity was visually faultless! I ALMOST CHOKED ON MY SKITTLES WHILST LAUGHING AWARD! Every year a handful of “comedies” are released and only a select few manage a snigger or a laugh. This year has been slightly encouraging though with a few films being released that were surprisingly funny. This is the End was by no means special but I giggled due to the works of Seth Rogan once again, and of course The Worlds End was very good displaying that classical Simon Pegg and Edgar Wright humour. However the best comedy of 2013 for me was The Heat! It was hilarious and included amazing humour achieved by the physical display as well as the dialogue. I was actually lucky to see the advanced viewing of The Heat all the way back in February/March and I can still remember the punch-lines. There was one scene out of many that made me hysterical and I actually choked on my skittles at the time, I shall just call that “the watermelon scene”. The Heat isn’t the best film ever but it definitely succeeded at making me laugh non-stop throughout so the award was a no-brainer! There’s nothing I find more interesting than how a film can make you feel so tense and on edge despite knowing full well it’s just fiction, it’s just a film. This year two films made me on edge, James Wan’s horror The Conjuring had one particular scene that made me amongst others a little bit clammy. However it was Captain Phillips that completely by surprise made me so tense and thrilled throughout viewing. Tom Hanks playing the lead role in a film based on the real life event of Somali pirates capturing the captain of an American cargo ship back in 2009. It had many breath taking and nervy scenes that was helped by the great performance of Tom Hanks. As well as being the tensest viewing experience of 2013, Captain Phillips is also one of my favourite releases. IT WAS SO WORTH BEING SURROUNDED BY KIDS AWARD! No matter how old you are there will always be certain films that you can’t help but go to the cinema and watch, despite it involving being surrounded by excitable kids and their parents. Despicable Me 2 was one of those films that I had to see and it was very worth it due the minion mayhem, but it was Monsters University that was the real entertainer. The long awaited sequel to the 2001 Monsters Inc. and the film of my childhood it was one I couldn’t resist. Watching Mike and Sully back at university competing in the scare games was great and it really made me feel like a little child again. I might have looked a bit odd laughing and smiling throughout but the film was amazing. I really don’t regret going to the cinema to see it at all even I did look like a big kid and I’m sure there were many others out there just like me! YOU SHOULD QUIT THE FATHER AND SON DUO AWARD! It’s always a disaster waiting to happen when a film becomes a family project. However the film that needed to ditch its father and son duo wasn’t A Good Day To Die Hard but Will and Jadon Smith’s After Earth. The father and son duo had struck lucky with The Pursuit Of Happiness but it wasn’t going to happen again. Jadon really can’t act and the storyline was so dull, at times I didn’t know what was worse. The film previously had such a huge advertisement campaign focusing on the pairing but after this display, this should be the last time we see the Smith’s on the big screen together for a while. LETS JUST SHHH AND ENJOY THE CINEMATOGRAPHY AND SOUNDTRACK AWARD! I had to squeeze this film in here somehow! Many will criticise and shame Nicholas Winding Refn’s 2013 Only God Forgives but for me it was a technical and visual master display. It was the unlabelled sequel to the very popular and prestigious Drive (2011) but the film itself was very different. Despite a quiet story, the technical side of Only God Forgives was amazing, the cinematography was really as good as it gets. I’ve heard this film being described as many things, but the one that was really spot on was, “Perfect photography without the caption.” Once again like Drive the soundtrack was also brilliant. Even if you don’t have a clue about what is going on you can’t shun the faultless visuals and for me it was one of the best and underrated releases this year. I WAS BRIEFLY SCARED AWARD! 2013 for horror was very disappointing in comparison to my original expectations. With big name releases like The Evil Dead and Carrie I was hoping for something else apart from just gore but that didn’t arrive. Surprisingly though it was two of the less talked about films that made the impact, Mama was especially good but James Wan’s The Conjuring for me was the best horror. It had an interesting story that was executed well resulting in a few moments where I was actually scared. The “clap game scene” especially showed that. Again it was nothing too special but it was definitely the best out of the bunch. Usually when a bag full of sequels gets released it’s for the wrong reasons and they only produce a dent in their franchise. 2013 however was a good year for sequels with the likes of, Monsters University, A good day to Die Hard, Despicable Me 2, The Hunger Games etc. but as expected there was no contest as soon as The Hobbit: Desolation of Smaug was released. The prequels to the best trilogy made in Lord Of The Rings, The Hobbit films were always going to have high expectations and they’ve surely delivered. Once again the entertainment flourished with a great storyline and cast recreating that much loved adventurous feel. There is no other alternative than to choose The Hobbit as the best sequel! There are always those films and those characters that you can’t help but get attached too and this is purely down to the great performances captured by the actors and actresses. This year for me I saw two standout performances, Colin Farrell although only playing a side-role in Saving Mr Banks was absolutely brilliant. It was Farrell’s co-star Tom Hanks that gave the best performance of 2013 though, in the outstanding Captain Phillips. Tom Hanks reminded us all just why many regard him as one of the greatest actors of recent years. It was the final scene that really showed this, as a hysterical Tom Hanks captured brilliantly the feelings of Captain Richard Phillips. There will be no surprise if Hanks wins many awards for his role as without it Captain Phillips wouldn’t have been as enjoyable and as impacting. There’s my non-generic awards for 2013, feel free to comment on all those wonderful controversial statements, or perhaps agree with my absolute correctness. After huge success with 2004 “zom-com” Shaun Of The Dead, comedy duo Nick Frost and Simon Pegg pair up again to create Hot Fuzz. Simon Pegg also pairing to co-write with Egdar Wright once again, Hot Fuzz is another hugely hilarious brilliant film, with constant entertainment. It makes many references to their previous film, with Nick Frost still addicted to cornetos. It makes further references to other famous films also providing many laughs with their “Brit wit” sense of humour. Simon Pegg plays London cop Nicholas Angel, but he isn’t any ordinary officer, he lives for his job and his job is his life. Sick and tired of his constant arrests and being too good for his job, fellow colleagues such as (Bill Baily) and his sergeant (Martin Freeman) transfers him to a small English village town of Sanford. With no choice in the matter he travels to the supposedly quiet little town of Sanford however it isn’t as quiet as suspected as a series of unordinary “accidents” occur. Officer Angel is paired with local moron and lazeabout PC Danny Butterman who just happens to be the inspectors son (Jim Broadbent) Danny’s usual day consists of buying cornetos and then the pub however this is all about to change now he has Nicholas Angel as his partner. The comedy duo Nick Frost and Simon Pegg have huge success again keeping you constantly laughing with gags and goose changing. The film itself leaves the duo to provide laughter with the storyline providing the action. However Hot Fuzz isn’t just a normal action film with explosions and guns it takes a twist involving the elderly and reversing stereotypes. Although tense it made me laugh as well as being glued to the screen. It surprised me with how they presented deaths, although set in a small village it wasn’t pitchforks and shotguns but gruesome deaths that also play homage to other well-known films. The film fuels on the duo of Nicholas Angel and Danny Butterman investigating the link to all these “accidents”. Once realising the truth, that I will not reveal they are then spilt between two decisions and have to work out what’s for the greater good. The acting in Hot Fuzz for me is outstanding, Nick Frost and Simon Pegg are brilliant once again. Simon Pegg and Egdar Wright deserve a lot of credit for their storyline, it’s unique, funny and action packed. The laughs in this film are great and big, and so is the action. The supporting cast is also great alongside the cameos of well-known actors including Steve Merchant, Steve Coogab and Bill Nighly previously used in Shaun Of The Dead. Hot Fuzz certainly ticks a lot of the right boxes, if you loved Shaun Of The Dead you will love this as it lives up to its standard. One that will make you laugh and another must watch. 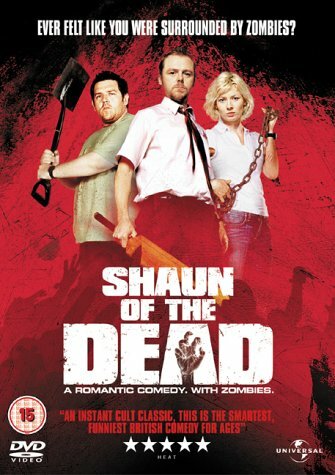 Shaun Of The Dead is a British comedy about two best friends encountering a zombie invasion in London. Where most zombie films focus on the undead, this film takes a different approach and is more like a sitcom focusing on ordinary life problems but with flesh eating zombies getting in the way. Best-buds, housemates, drinking partners and lazy morons Shaun and Ed (Simon Pegg, Nick Frost) aim to fight away the shuffling zombies roaming London rescue loved ones and go to the local pub, The Winchester for a nice pint. The film opens with a list of mocking ironic hints at a zombie invasion, almost teasing you. While the real world has its problems so does the world of Shaun, spending all his time in the local pub with Ed and working in a poxy small retail store his girlfriend Liz (Kate Ashfield) leaves him. However Shaun will fight for her and try and get her back but first a trip to The Winchester with Ed and a few beers. Waking up after choking on his own dribble Shaun and Ed realise that Zombies are walking the streets of London. Ignoring advice and love for classic records they fight back in hope of saving Shaun’s mum Barbara (Penelope Wilton) and getting back Liz. In true comedy style they bash and bump their way through the undead with a cricket bat and shovel all fuelled from a can of coke and a Corneto. Shaun of The Dead plays to the humorous British stereotypes with the characters of Shaun’s mum Barbara and her husband Phil (Bill Nigly). In the face of death and hell the two stand firm in true British style by running bite wounds under a cold tap, putting on the kettle and making sandwiches. The play on the stereotypes brings laughs so credit to writers Edgar and Simon. Shaun of The Dead is a very different take on the somewhat exhausted genre of zombie films. It creates many laughs and that’s down to the comedy duo Simon Pegg and Nick Frost who act very well as clueless morons. All in all this film gives you exactly what you expected, lots of laughs and comical idiotic ways of killing zombies. The best “zom-com” out there and possibly the only one with a soundtrack that includes Queen, a must watch film so don’t miss out.